What will happen to Ethan Couch? 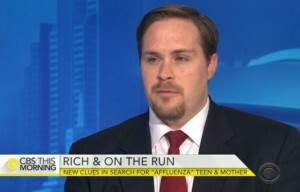 We’ve recently been asked about fugitive Ethan Couch, the Texas teenager that was adjudicated of intoxication manslaughter, and the potential consequences for the “affluenza” teen once he’s caught. Juvenile determinate sentencing in Texas is an area of law with which most people are unfamiliar. In this post, attorney Luke Williams explains some of the possible punishment scenarios for Ethan Couch under the juvenile justice and adult criminal justice systems. Has Ethan Couch violated his probation? Once Ethan Couch is apprehended, the State will have to prove, by a preponderance of evidence, that the teen violated a term or condition of his probation. Because juvenile records are confidential under Texas law, the public or press has not been made known of the details of Couch’s probation up to this point. But typically – at the very least – a juvenile probation in Tarrant County requires a juvenile to abstain from the use of drugs and alcohol, avoid persons or places who are using drugs and alcohol, and report regularly to the juvenile probation department. In light of the recent Twitter video showing what purports to be Ethan Couch at a party involving alcohol and drinking games, there could potentially be evidence that he violated his probation by being amongst persons and at a place where persons are using alcohol. This could be difficult to prove. But, the more pressing problem for the teen now is his disappearance. He would undoubtedly have been required to check in with the juvenile probation department on a regular basis or when requested. At this point, as evidenced by the arrest warrant that has been activated for him, we know that he not checked in with probation as required. So, the State will likely have a much easier case to prove that he’s violated his probation by absconding. Ethan Couch’s probation term is scheduled to extend beyond his 19th birthday. However, the juvenile court will have to discharge Couch on his 19th birthday unless the court has acted earlier to transfer the probation to the appropriate criminal adult County Community Supervision and Corrections Department. This can (and likely will) be done by motion of the state prosecutor in Couch’s case. If transferred, Couch would be under the jurisdiction of the county’s adult probation department and would face adult prison time should the probation be revoked. This would be the normal course of events had Couch not absconded. What happens once the Ethan Couch is found? Revoke his probation to commit him to the custody of Texas Juvenile Justice Department (TJJD) for a determinate sentence that “does not exceed the original sentence assessed by the court” (10 years). The court could commit the juvenile for a shorter sentence than originally assessed, but not for a longer one. See our earlier post to read more about determinate sentences. If Couch is caught after he turns 19, we can presume that the State will have filed a motion to transfer the probation to adult supervision. If the probation is transferred to adult court, and Couch is found to have violated the probation, then the court could sentence him to serve his original sentence (up to 10 years) in the Texas Department of Corrections – Institutional Division (otherwise known as the adult penitentiary). Again, because juvenile records are confidential under Texas law, details of Couch’s probation up to this point are unclear. So, there could be other details and/or Orders issued by the judge in Couch’s case that could change or negate the possible scenarios mentioned above. Regardless, the fact that Couch remains missing is not a good thing for his future.